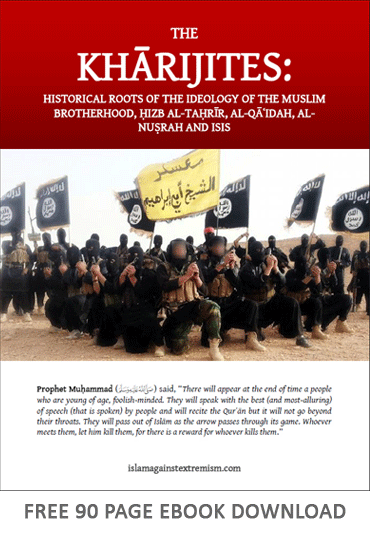 Refutations of Ibn Taymiyyah Against the Doctrines of al-Qaeda and ISIS: Part 1. The aim of this series is to dismantle the various elements comprising this broad ideology and prove that Ibn Taymiyyah is not the source of these ideas. Rather, the source of these ideas are the very first Khārijites: Dhul-Khuwayṣarah, the Sabaʾiyyah, and the Muḥakkimah. Those whose slogans were "social justice", "ruling by what Allāh revealed" and "jihād", "enjoining good and prohibiting evil" and who were motivated by matters of the world whilst cloaked in religion and its lofty slogans. These ideas were revived by 20th century thinkers and activists some of whom were influenced by European revolutionary movements led by the Marxist ideology of social justice and equal distribution of wealth. These writers are Ḥasan al-Bannā, Abū Aʿlā Mawdūdī, Sayyid Quṭb and Taqī al-Dīn al-Nabahānī. PDF File.